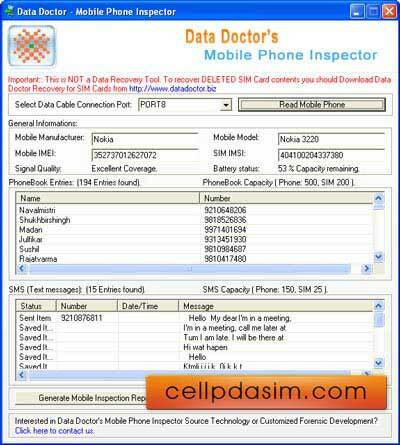 Mobile phone inspector displays all hardware details like model number, manufacturer name, battery status and signal quality. Cell phone investigation program can extract entire sms and phonebook records accurately. Software with VC++ source code completely describes all latest mobile technologies. Mobile phone examiner application efficiently reveals IMSI and IMEI numbers. Cell phone forensic utility supports various Symbian OS based handsets.